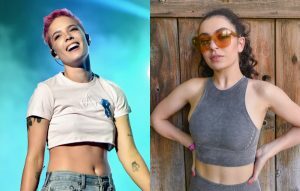 Halsey has announced that she’s touring with Charli XCX. The US singer will release new record ‘Hopeless Fountain Kingdom’ on June 2. It’s the follow-up to her 2015 top 10 debut ‘Badlands’. Halsey will tour North America in support of the album during September, October and November. Charli XCX will support during the dates, with PartyNextDoor also billed as a “special guest”. Announcing the news on Twitter, Halsey wrote: “This is the biggest tour I’ve ever done. and I’m gonna bring u the biggest show to go with it”. Halsey recently unveiled her new album’s tracklisting. Earlier this year, Halsey gave fans a taster of new material by dropping ‘Not Afraid Anymore’ from the Fifthy Shades Darker soundtrack. She’ll be returning to the UK for shows supporting Justin Bieber at his British Summer Time gig at London’s Hyde Park, as well as performing at Glastonbury 2017 and Reading & Leeds. The post Halsey and Charli XCX to tour together appeared first on NME.